This internet connection speed map shows the average peak speed of connections, by each state in the USA. This is a little different to average internet speed. Why measure average peak internet speed? It shows the potential for internet connectivity in your local area. Your own connection via an internet speed test may be above or below your state's average. It's nice to know what is possible where you live, or do business. 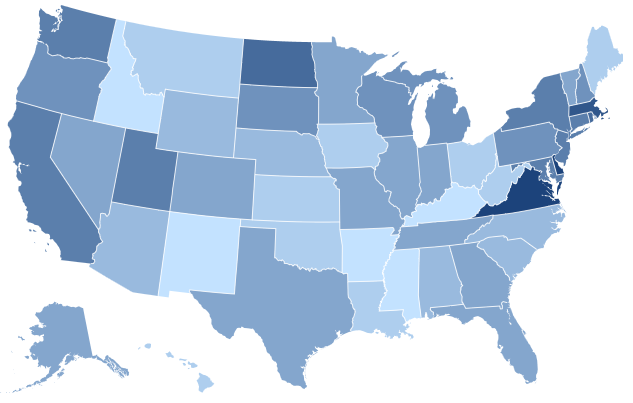 Hover over the state you live in, to see the average peak internet speed for your state. To see average speeds by state or how US internet stacks up against our close overseas neighbors, click on a link in the index to be taken to the relevant table. How is peak internet speed measured? Akamai states; "to calculate this metric, an average is taken of only the highest connection speed calculated from each unique IP address determined to be in a specific country/region or U.S. state". What does average peak internet speed mean? "The average peak connection speed is more representative of Internet connection capacity. By using the fastest measurement observed from each unique IP address, we are capturing just those connections that reached maximum throughput rates. Presenting an average mitigates the impact of the extremes - while there may be users connecting at Gigabit speeds in a given country, there will also be users connecting at dial-up, satellite, or DSL speeds" - Akamai. Is your internet connection well below the average peak? Geographic location / service availability (coverage). Current service. Copper based services such as DSL, aDSL and aDSL2+ are distance sensitive. Copper based internet service speeds degrade the further away from your local telephone exchange. Services such as WiFi (wireless) rely on coverage and signal strength via 'hot spots' and the presence of an antenna. Fiber internet is not distance sensitive and typically will exceed the speeds offered by copper based connections. Contact your local internet service provider to see if there is a service upgrade available. Speak to tech support to see what they can do, or look up any guides from your local ISP on speed improvements. Check to see if there are bonded or fiber optic internet options available in your local area. For WiFi, potentially upgrade your modem / router. More tips here on how to boost your WiFi signal. Most internet services in the USA are not symmetric. Upload and download speeds are not the same. Most connections offer more download speed. To increase speed, pause any uploads. More info here on how to increase internet download speeds. Where does the internet speed data come from? Our data comes from the latest Akamai State of the Internet report. Internet speed measurements in the report are from requests to Akamai's platform. Over a quarter, they analyze between 100 to 200 trillion requests, from more than 200 countries globally. How is average internet connection speed measured? Average internet speed by is calculated by taking an average of all of the connection speeds during the quarter, from unique IP addresses (IPv4) from specific U.S. states. To see how USA internet speeds compare against other countries all over the world, see our global map of average internet speeds by country.